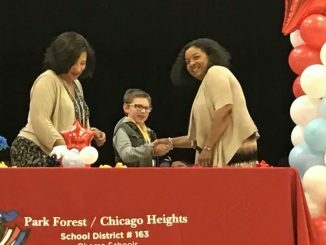 Park Forest, IL-(ENEWSPF)- Park Forest-Chicago Heights School District 163 will collaborate with Chicago Arts Partnerships in Education (CAPE), a non-profit community-based organization, on the STEAM Ahead project. The U.S. Department of Education’s Assistance for Arts Education Development and Dissemination grant program awarded CAPE, in partnership with School District 163, a grant of $2,257,596 to support the project through a competitive process. CAPE received one of the 22 grants awarded across 13 states nationally, out of 96 applications reviewed. District 163 is the only school district in Illinois that is a STEAM Ahead grant partner. STEAM Ahead will enrich kindergarten through fifth grades STEAM (science, technology, arts, mathematics) curriculum. The STEAM Ahead grant will span a four-year period and will provide the District’s art and STEAM teachers and kindergarten-fifth grades students with access to CAPE’s professional Teaching Artists and staff who are steeped in STEAM strategies, techniques and research. Professional development for the STEAM and art teachers and classroom supplies and materials also will be provided through the grant. 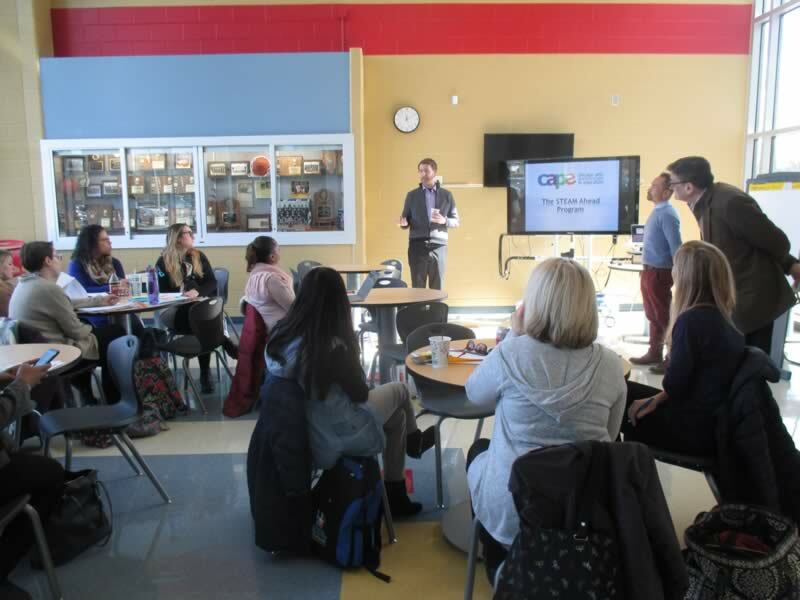 The District staff and the CAPE team will work together during the life of the grant to create a guide that will be a model for kindergarten-fifth grades teachers throughout the nation, according to Scott Sikkema, CAPE’s education director. He noted during a presentation at a District 163 Education Committee meeting that since 2003, CAPE has received four of these grants, which come through the U.S. Department of Education in the form of an Assistance for Arts Education Development and Dissemination (AAEDD) grant. CAPE’s research indicated that each grant program demonstrated growth in teacher capacity and student achievement. An outside evaluator will review the CAPE-District 163 STEAM Ahead program at its conclusion. 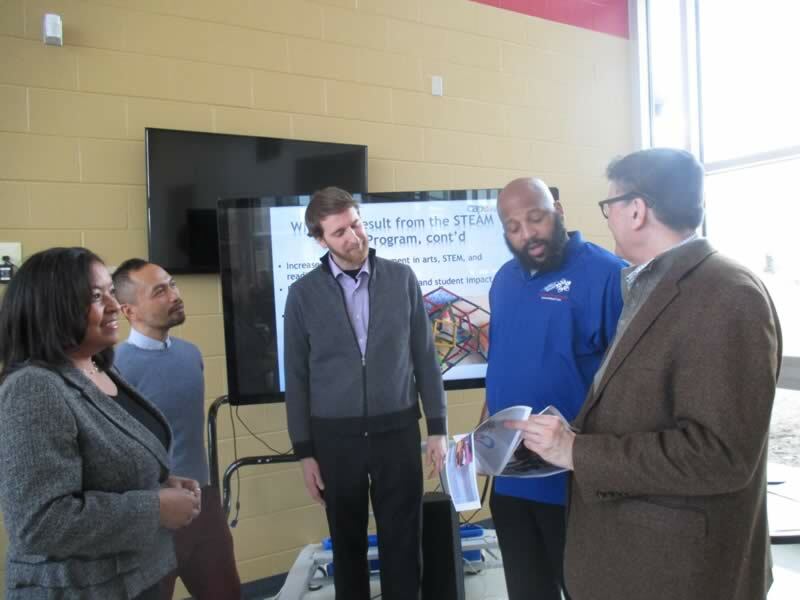 The CAPE representatives said that the District art teachers would partner with CAPE’s professional teaching artists to co-design and co-teach STEAM curricula. These teaching artists also will co-teach STEAM-integrated sessions with STEAM and classroom teachers from kindergarten through fifth grade. This multi-leveled approach will ensure that participating students benefit from inquiry-based, collaborative STEAM projects in their art rooms and daily classrooms, while also enriching and expanding their teachers’ abilities to weave the arts into science, technology, engineering, and math lessons. During the Education Committee meeting, Joseph Spilberg, associate director of education, added that the CAPE strategies involve immersing students in their learning in engaging ways. Innovative and effective standards-based teaching and learning that addresses state and national science, math, and core arts standards. With Ms. Finnan, the STEAM teachers include Lori Mitchell, Mohawk Primary Center, and Eileen Ward, Blackhawk Primary Center. The art teachers are Patricia Sanborn-Novikas, Michelle Obama School; Francesca Wessley, Barack Obama School; and Hannah Matos, 21st Century, Mohawk, and Blackhawk. This is a release from Park Forest-Chicago Heights School District 163.